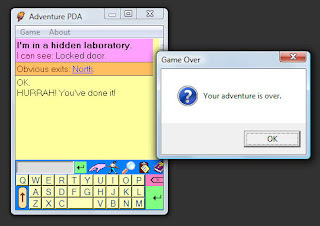 My first wife Alexis wanted another go at writing an Adventure game. This time around it was more the case of me asking what she wanted in the rooms and then I built a game around that. The funhouse who had the same name as the game actually sued us! Sad thing was it was near the days of AI's close and when they "won" their lawsuit they were left holding nothing. I have no idea what they thought they were accomplishing. Unlike Mission Impossible where we got a cease and desist request (the game got relabled secret mission) they never contacted us in advance and just sued us. Must have though the company had deep pockets, which of course it did not! Thanks very much again for reading and commenting, Scott. These kinds of questions never seem to get asked in formal interviews about your work -- I greatly appreciate you responding to my idle speculations about AI trivia! Sorry to hear about the pointless lawsuit -- sounds like they didn't really know how to approach the situation. 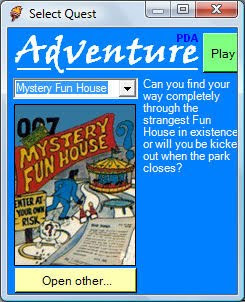 And the whole legal question's REALLY moot now, as the Mystery Fun House attraction closed its doors in 2001! Cool write up. I'm only half way through this quest as I'm doing uni currently so I skipped the spoilers (for now ;), but its nice to see your quest is going OK. I did a lot of bug testing with my AdvPDA engine and also came across the lighting bug in adv#9 as my code is loosely based on Scott Free and ASFD but with bugfixes (also I think the same action routine is used in Golden Voyage when on the boat, sailing by direction). Some nice routines by Scott there. My "Whats New" text file may point out bugs found and rectified which may still exist in the latest versions of Scott Free / ASFD - just in case you use those engines for future quests and think something is not right - my bug fixes may shed light (literally in the #9 case ;). Happy adventuring! Thanks for the quality assurance on your code -- I really like your PDA interpreter and if I had a suitable device I would probably have played more of the games on it. Glad to know the old ScottFree bugs are visible from a pure interpreter standpoint and that you've been able to address some of them. Most didn't get in the way of playing, but those lighting puzzles in a couple of games really showed off ScottFree's imperfections! FYI if I remember correctly there's a button you push that turns the gentle air into a blast of air. So don't push it! It's the red knob in the storage room above the merry-go-round that changes the air pressure.